Check out these cheap deals for the Asmodus Colossal Box Mod. Smart and stylish, the Asmodus Colossal Box Mod offers a compact vape mod with all the power you need, packed into its relatively dainty size. With a decent 80W of power, this device is easy to use and comes with full temperature support and an easy to read 23mm x 12mm OLED touch screen. The display is very easy to navigate, offering a simple 5-line menu and an easy to manage touch screen helps you to easily adjust settings and navigate the mod. The Asmodus Colossal Box Mod measures 75mm x 25mm x 40mm making it nice and easy to place into your pocket and carry around with you. A smart and functional design, it feels excellent in the hand with the cool zinc alloy feel making sure it also feels pleasant to touch. Fitting into your hand with utter ease, this simple to use vape offers simplicity and style in equal measure. 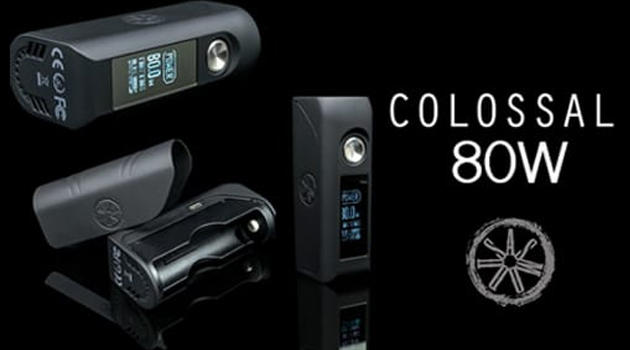 If you are looking for a vape that’s available in various styles, this mod comes in everything from a fine metallic blue to a burgundy red as well as standard silver and white designs. The bright pink option offers you a nice, effervescent looking appearance that really turns heads and can easily be appreciated by those who like a bit more style. All it takes is a few taps of the display to use this mod. The touch screen gives you all the information that you need from the output wattage and temperature to voltage and battery life. Technically, this mod features various modes including Ni200 Nickel support, titanium support, stainless support during variable temperature operation with a 572 degrees Fahrenheit capability. Temperature control is said to provide a crisp, smooth draw. The highest wattage output in power mode is 80 watts while the lowest resistance in any mode is a very low 0.10ohm. Utilizing a 18650 battery, the cell simply slides into the battery bay via an effortless battery door with silver plated contacts. Unfortunately, batteries are sold separately. The cell can be charged using a micro USB port which also supports firmware upgrades to ensure your mod is always running at full operational capacity. The stainless steel 510 threaded connector at the top works well with any standard atomizer and ensures flush and easy installation.